Scopus has recently added over 195 million more cited references dating back to 1970 to complement the database's existing records that date back 1788 and further increase the depth of content. Learn more about the depth of Scopus content along with more insights into our content policies, selection criteria and data quality. Bill Mischo, Head of the Grainger Engineering Library Information Center, at the University of Illinois at Urbana-Champaign, shows how he employed a combination of Scopus APIs to generate research impact visualizations to support strategic planning in the College of Engineering’s new engineering-based college of medicine. The custom databases and visualizations showcase the research impact of various units or groups– for grant applications, program review, and other research assessments. It also allows individual researchers to visualize their research network. Matt DiRenzo (Scopus APIs Product Manager) will discuss some of the basic (and more complex) use cases of the Scopus APIs and their advantages when compared to downloading data from the scopus.com platform. Scopus is considered the Gold Standard for research assessment and evaluation purposes by 4,500+ universities and 150+ leading research organizations worldwide. Join as us we discuss the richness of Scopus data and the value it provides for data-driven insight. Over the past 10 years, Scopus has emerged as the partner of choice in the fast-developing field of rankings. Join us for a discussion on the importance of A&I data to ranking organizations, and why they choose Scopus. PlumX Metrics will soon become the primary source of article-level metrics on Scopus. As Plum Analytics’ comprehensive, item-level Metrics, PlumX Metrics provide insights into the ways people interact with individual pieces of research output (articles, conference proceedings, book chapters and many more) in the online environment. CiteScore 2016 annual values were recently released for over 22,600 titles. Additionally, a number of improvements have been made to CiteScore based on user feedback. Join us for a discussion with time for questions and answers! Join us as we discuss CiteScore metrics - the free, transparent, comprehensive, and current metrics now available as part of the Scopus basket of metrics. -Why have CiteScore metrics been added to the basket? -How can CiteScore metrics be accessed? Join us as we share some exciting new initiatives and discuss what’s to come in the remainder of 2016 and in 2017. We’ll also be giving updates on content coverage and content curation programs, as a lot has happened since we last presented on Scopus content in February. Tune in to stay current on all there is to know about Scopus - the Gold Standard multidisciplinary abstract and citation database. Join us as we discuss best practices so that you can use Scopus to power up your research. We'll be highlighting tips and tricks and also reviewing what has happened in Scopus so far in 2016. This webinar will take a look at the Scopus APIs and how you can integrate Scopus content and data into your own websites and applications. We will take a deeper look at the automated creation and curation of Scopus Author Profiles and discuss how researchers can use Scopus to showcase their work. This webinar will give an overview of the analysis tools in Scopus. We will focus on the comprehensive suite of metrics embedded throughout Scopus and how it helps facilitate evaluation and provide a better view of your research interests. This webinar will focus on how to personalize your Scopus experience and make your search more effective. We will also spend a significant portion of the time on basic search and how you can use it to be more efficient in your research. Scopus features comprehensive, up-to-date, unbiased & reliable content. 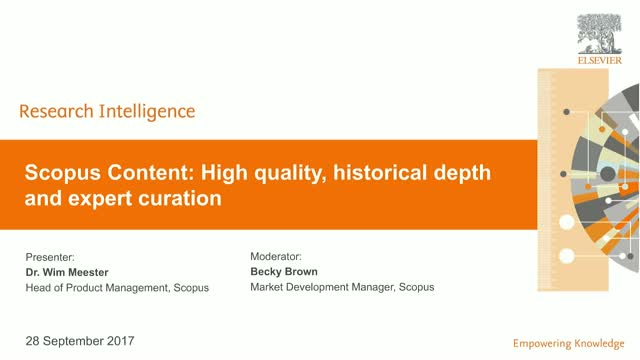 In this webinar we will walk you through our content selection process, curation programs, expansion programs, the impact of metrics, what is to come in 2016 and some fun tips and tricks on how you can get the most out of the Scopus content. You will find out why Scopus gives you the most complete picture of what is going on in the world of research. This webinar will focus on the feature and content updates that were made to Scopus throughout 2015. We'll cover topics like the article-level metrics module, the books and cited reference expansion projects, and much more. We will also take a look forward to show you what you can expect from Scopus in 2016. Librarians will discuss metrics-related library services for the individual (grad student, faculty/researcher) to inform career development, publishing decisions, etc., and at the department level for the purpose of analysis and benchmarking. Other highlights include an overview of the world of metrics, the mainstreaming of altmetrics, and a look at the new Scopus Article Metrics module. Join research data librarians and leaders in developing library infrastructure and services, as well as Mendeley's research data expert, for insight into how to help researchers share their research data -- from instruction and tools to motivating them with metrics for research data impact. Scopus is the largest abstract and citation database of peer-reviewed literature including scientific journals, books and conference proceedings. Delivering a comprehensive overview of the world's research output in the fields of science, technology, medicine, social sciences, and arts and humanities, Scopus features smart tools to track, analyze and visualize research. These monthly webinars will showcase how to use and benefit from Scopus.